Vanguard Total Bond Market II Index Fund (VTBIX) is a popular bond mutual fund. This vanguard fund invests in US bond markets. This Vanguard Total Bond Market II Index Fund (VTBIX) objective is to track the performance of a broad, market-weighted bond index. The index benchmark is the Barclays U.S. Aggregate Float Adjusted Index. This fixed income fund invests mainly in a diversified exposure to investment-grade U.S. bond market. This index fund has an Intermediate-duration portfolio. This Vanguard Total Bond Market II Index Fund is managed by Joshua C. Barrickman since 2010. It has 12-month dividend yield of 2.21%. The total net assets are $84.7 billion. It has an annual holdings turnover of 111%. This index mutual fund has a low expense ratio is 0.12%. Since this investor class fund was first introduced to public in 2009, it has achieved 3 years of positive return and 1 year of negative return. This popular intermediate-term bond fund has a 3-year average return of -2.29%. This VTBIX fund has 2-stars rating from Morningstar. 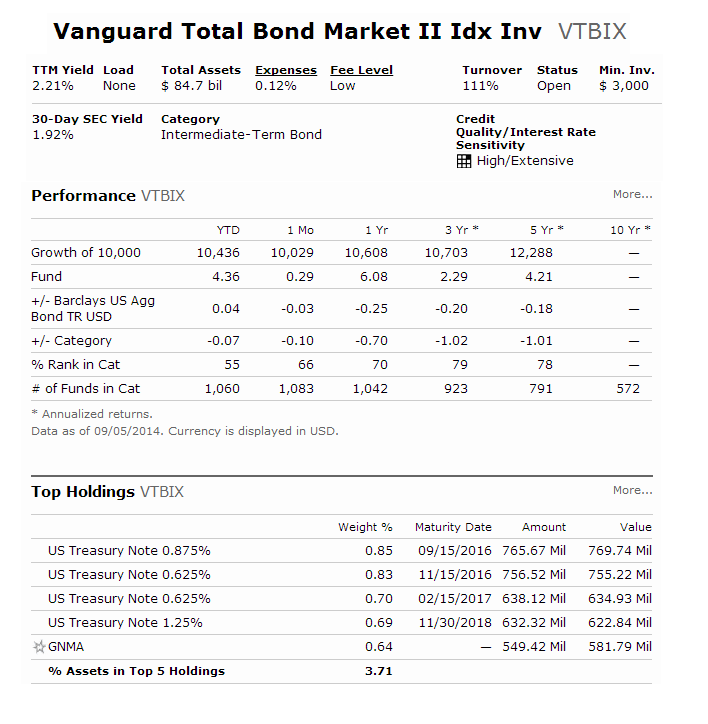 This Vanguard Total Bond Market II Index Fund is available in another class such as VTBNX (Institutional Class). You can buy this bond fund with a minimum initial investment of $3000, for either brokerage or retirement account. You can buy from your online broker such as Vanguard, TD Ameritrade, Schwab, etc. As of September, 2014, the top 5 debt sectors are U.S. Treasury (40%), corporate bond (19.55%), gency MBS pass-through (18.76%), commercial MBS (4.78%), and U.S. agency (3%). Top 3 holdings are US Treasury Note 0.875% (2016), US Treasury Note 0.625% (2016), and US Treasury Note 0.625% (2017). This popular bond fund has an average effective duration of 5.60 years. The average effective maturity is 7.60 years. The average credit quality is AA (investment grade). The investment risks include market conditions, investing in bonds, management risk, interest rate risk, etc. This Vanguard Total Bond Market II Index Fund has a low expense fee. There is no sales load. It is easy to invest through brokerage.